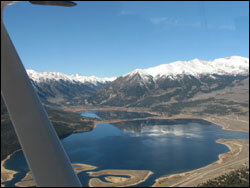 Aviation enthusiasts are promoting May 15 as Learn to Fly day. I am proud of my accomplishment and very much enjoy the privilege of flying. However, as we approach Learn to Fly day, I am pondering should I learn not to fly? One of the easiest decisions I ever made was to learning to fly. It was something I had always wanted to do so from that standpoint I am not even aware of when I made the decision or deliberated about it. It was just something I always wanted to do. Achieving the goal was a little harder but in retrospect not all that challenging. It was just getting around to taking the first step and of course to funding it that took some time. In the Spring of 2004, I finally made the commitment and earned my licenses three and a half months later. Now, I face a more difficult challenge, one faced all too often by pilots, the decision whether to continue to fly or to hang up the flight bag. I would never have imagined being at this point, and pondering that as an option after all those years of dreaming of flying and the wonderful six years as a pilot. But I am a month, maybe weeks away from becoming a father to twins. They occupy much of my thoughts these days as I assume they always will. In thinking of them I have thought about flying and how my passion for aviation fits with my expanding family. At a recent aviation get together I heard many pilots explain that they just recently returned to flying after 15-20 years away from aviation in which they focused on raising their families. This helped spur the conversation in my head in which I am continually debating what role aviation should play in my life over the next twenty years. One side of the argument says what a great life lesson it is for children to see their father went after one of his dreams and is passionately continuing to pursue and foster that dream. I would love sharing my love of aviation with them. Additionally, the benefits of general aviation could offer us greater flexibility in travel and entertainment. Flying also brings me great joy, satisfaction and a sense of accomplishment that would be tough to forgo. A flight does not go by in which my wife does not positively comment on the glow on my face or the happiness in my voice after I return from flying. Each flight is an experience like no other that I truly treasure. On the other side of the conversation are things like cost, time and safety. Let's face it: this is one expensive hobby. My mind is swirling with the costs of diapers, day care, and college tuition and flying seems like an expense that brings great joy to me but maybe not to the entire family. In addition to the monetary costs it is a time investment. Each flight represents a few hours away from the family (at least at first when they are so young) not to mention any time spent planning flights or continuing to learn. I may be naive (everyone says I have no idea what is about to happen in my life) but I cannot imagine wanting to spend hours away from these little ones on a weekend. I wonder will I prefer to take them for a walk or to a park on a sunny day rather than heading off to the airport. I also wonder if I can find the time to continue to be a safe pilot which leads to the safety issue. Am I putting my family at greater risk by participating in a hobby that is more dangerous than your average hobby of home improvement, gardening, golf or tennis? No matter what the decision I have to say I feel so blessed to have followed this dream and now to be given the opportunity to raise twins with my wife. If I do choose to continue to fly I do know then I need to go into it full bore. I need to invest the time and money to fly more frequently and work towards an instrument rating to help make me a safer pilot. Most of you, my readers, are pilots. So I am sure you all have gone through periods of your life where you have wondered if you should take a break or keep at the controls. I would love to hear your advice. I was blessed to be surrounded by people in my life who fostered the understanding that one should always follow their dreams and that one can do anything they put their minds to. It was with that support that I sought my dream of learning to fly back in 2004. So when I heard the story of Michael Combs, a pilot who is flying a Light Sport Aircraft to all 50 States to spread the message "it's never too late to follow your dreams", I knew I had to meet him. This afternoon he arrived in Chicago at Chicago Executive Airport. I worked with my flight club, Windy City Flyers, who were kind enough to offer Combs hangar space for his stay. They also invited Combs to share his message with the Aviation Explorer Post 9, a group of 14-21 year olds interested in aviation. It was great hearing Combs sharing his message with these kids and encouraging them to continue to foster their love for aviation or whatever other dreams they might have. Combs admitted that he had two options when coming up with his Flight for the Human Spirit. He could wait until it was completely funded but then he might never have made it off the ground. Instead he built a plan and after gaining some momentum and support he took to flight. Each day as he spreads his message he is receiving more and more support and sure enough things are coming together for his Flight for the Human Spirit. I invite you to visit the Flight for the Human Spirit to track his adventure. You can support the flight by making a donation on the site as well. 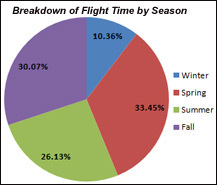 I recently successfully completed my third biennial flight review since learning to fly. Although, the process is becoming customary to me this most recent experience was unlike my previous two flight review experiences. The flight review is not a pass / fail test. Instead it is an assessment of a pilot's knowledge and skill that if the Certified Flight Instructor deems are sufficient you will receive a logbook endorsement allowing you to continue to fully utilize the privilege's of your license for another twenty-four months. If the CFI recognizes some serious deficiencies they will not sign-off on the review, which means the pilot must work on those deficiencies then retake the review. If the pilot has not past the twenty-four month mark since their last review they may continue to fly, after that there are some restrictions put in place until they complete the review satisfactorily. The first two times I was too engrossed with proving my knowledge and worthiness of being a pilot to recognize this opportunity for what it is, a learning experience. Many pilots have heard the saying that the Pilot's License is "Your ticket to learn", the flight review is a perfect opportunity to continue that learning process. To prepare for this review I made notes of things I have struggled to understand and questions that have come up in flight experiences that I had not yet sought a satisfactory answer for. During both the one hour of ground and one hour of flight instruction there were items that were not as clear to me as they once were and we talked through those. I also made sure to bring up the questions and topics for which I wanted a refresher on and as a result I feel I got more out of this review than any previous review. Don't be worried about knowing every answer to every question. Use this truly as a learning experience and you will do fine. Remember that you are paying for the instructor's time so take advantage of the opportunity to learn through this process. One of my favorite things about being a private pilot is heading out for a cross-country flight. This month there are two exciting aviation adventures in which pilots will be flying aircraft literally across the country. One interesting thing is that in both cases the pilots are flying cross-country in Remos GX Light Sport Aircraft. A year ago I would have been surprised at the prospects of flying far from home in a Light Sport Aircraft. However, while at AirVenture in Oshkosh this past summer, I had the opportunity to fly the Remos GX and was pleasantly surprised by its performance. Michael Combs was not satisfied with dreaming of flying. 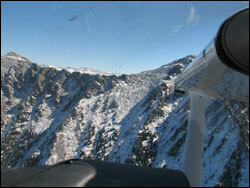 However, a history of heart problems had kept him grounded until the advent of the Sport Pilot License. The Sport Pilot License does not require an FAA Medical Certificate, with that hurdle out of the way, he jumped at the opportunity and earned his license to fly. Now Michael is on a mission to spread the simple message that "It is never to late to follow your dreams." His goal is reach 20 million people with this message. What better way to do it than by continuing to follow his dream of flying. So Michael will depart on Tuesday from Salina, Kansas in a Remos GX Light Sport Aircraft on a journey to all fifty states, covering 19,400 miles enroute and visiting 135 cities. 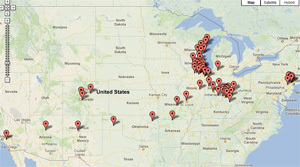 One of the airports Combs will stop at is my home base, Chicago Executive Airport, just outside of Chicago. I was able to get support for his mission from my flight club, Windy City Flyers, who will be supplying a hangar for his aircraft during his visit. If you are in Chicago and would like to meet Combs, visit the Chicago Aviation Meetup Group as I am organizing a meet and greet for when he arrives. You can follow the Combs's adventure and check-out his route on his website. If you use Twitter be sure to follow him (@combscoach) and the Flight for Human Spirit Mission Control (@fhsmissionctrl). 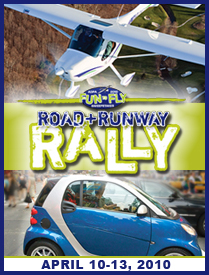 The second adventure is AOPA's Road and Runway Rally. Two teams will depart from AOPA headquarters in Frederick, MD this Saturday, one in a Smart Car and the other in a Remos GX, enroute to Lakeland, FL home of the Sun 'n Fun Fly-In. As they make their way south they will compete in a variety of challenges, meeting in St. Augustine, FL to swap vehicles and continue to Lakeland. Team Orville is made up by Alyssa J. Miller (@ajmalay), AOPA Director of eMedia & Wired.com Correspondent Jason Paur (@jasonpaur). Their competitors on Team Wilbur are Flight Training Deputy Editor Ian J. Twombly (@ijtwombly) and Motor Week Associate Producer Steven Chupnick (@motorweek). As for my aviation adventures ... I hope to back in the sky before the end of the week, Mother Nature providing. It has been way to long since I have flown last and the flying itch is turning into a rash. As a result, I am hedging my bets by reserving a Cessna 172SP on both Saturday and Sunday of next week hoping that one of those days Mother Nature cooperates. My goal for the next few flights is to fly with an instructor and knock off the cobwebs while working on my proficiency. I am quickly approaching the deadline for another flight review (formerly known as the biennial flight review). 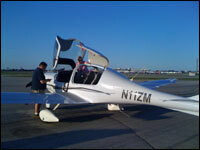 I completed my last flight review in April, 2008. My goal now is to take a few flights and spend some time reviewing all the regulations then partake in another flight review. I am hoping Mother Nature can do her part next weekend. For twenty five years Sporty's have helped pilots celebrate the Christmas Season with a line of Crystal Christmas Ornaments. This year their ornament features a P-51 Mustang that Sporty's Vice President John Zimmerman describes as "an iconic American airplane that is a rich part of our own aviation history." The P-51, often an airshow favorite, is the best air to air combat fighter ever flown. I added the P-51 Mustang to my collection which also includes a Cessna 195 (2005), Lockheed Constellation (2006), Spirit of St. Louis (2007), Cirrus (2008). About a third of my tree is now adorned with aviation centric ornaments. If you have a pilot on your gift list or are looking for another way to celebrate aviation during the holidays check out Sporty's line of ornaments. Last weekend I had the opportunity to fly with two friends and aviation entrepreneurs. Rod Rakic is the founder of MyTransponder, a growing aviation social network. He had a last minute cancellation and instead of flying alone decided to invite some fellow Chicago pilots to join him for a flight on a beautiful summer evening. I jumped at the offer as did Charlene Gervais. Charlene is the founder of Aviation Vacations, a new company offering flying tours of North America. When Rod is not flying for the Civil Air Patrol he prefers to fly the Diamond Star. I have several hours of PIC of the smaller DA20 but have never flown in the DA40 so I was looking forward to the experience. I was also looking forward to just my second flight out of Midway. There is something special about landing and departing with all the commercial air traffic at Midway. 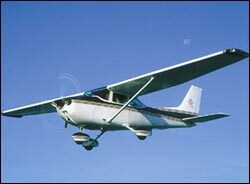 I have known Rod for several years and although we have tried we have never gone flying together. As a pilot who is fairly particular about who I fly with I was immediately put at ease when Rod provided a very detailed pre-departure briefing which included how we would handle emergencies and setting up guidelines for a sterile cockpit during the departure and arrivals. My CFI taught me such great habits early on in my training and I am always surprised to see that many pilots hop in their plane and depart without a briefing for passengers or other pilots on board. Once airborne we had a short and smooth flight over to Lansing where we landed and took just enough time for Charlene and I to trade seats before getting airborne for the return trip. As we returned to Midway the sun started to drop offering a beautiful display of colors and a nice view of the lit Chicago skyline. It was nice spending a few hours with some fellow pilots and sharing stories and enjoying a beautiful summer flight. I shot a few little clips of video during the flight and have posted the video below. Each year at the Chicago Air & Water Show Sean D. Tucker becomes a crowd favorite as he performers a memorable aerobatic routine in his Oracle Challenger bi-plane. I have always enjoyed his performances but it was an act outside of the plane that helped solidify him as my favorite airshow performer. A few years back at the Chicago Air & Water Show after a tiring performance he came down to show center and took the time to talk to the kids that were gathered and to sign a few autographs. His joy for flying was eaten up by the kids looking up to him and I realized he is one of the best ambassadors aviation could have. In advance of this year's show I was offered the opportunity to spend half a day with Sean D. Tucker and Team Oracle and jumped at the opportunity. I had no doubts, but after meeting Sean it was obvious that he absolutely loves coming to work each and every day, in fact I am sure he wouldn't call it work. You can see his enthusiasm first hand in this Chicago Tribune video interview. My day started by joining a few other photographers and videographers in the Team Oracle Piper Seneca. We shadowed Sean in his Oracle Challenger bi-plane and Ben Freelove in the Oracle Extra 300 as they conducted a formation flight over Chicago. This was an amazing experience to watch two extremely talented pilots communicate and manage formation flying. Additionally, it provided an amazing vantage point for taking photos and some video. Shortly after we landed I moved from the bulky Piper Seneca and into the sporty Extra 300. Ben got us airborne then said a magical thing "You have the plane". From that point forward he let me fly for a good 15-20 minutes while teaching me how to do various aerobatic maneuvers. We started with the basic rolls and loops and then he taught me how to combine the basic moves to do more advanced maneuvers like the Immelmen, Hammerhead & Cuban Eight. I was amazed at how well this plane performed and how easy it made all of these maneuvers. I am sure it helped that Ben is a phenomenal instructor which I am sure is a result of his experiences teaching at the Tutima Academy of Aviation Safety. I finished off by doing my first spin. In my five years of flying, I have never been through Spin training. I had always assumed it was somewhat dangerous since it was not part of mainstream training. I was surprised to learn how easy it was to recover from a spin. Prior to flying Sean had told me to be sure to have Ben show off the a few high-G maneuvers. After I had my share of flying I gave Ben his plane back and he put me through a 7.5G Hammerhead and then a high-G somersaulting roll, both of which were amazing. I love flying in general, but today's flight was an experience like no other I have had and I think I now have the aerobatic flying bug. I think I will have to seek out more opportunities to fly in an Extra 300. 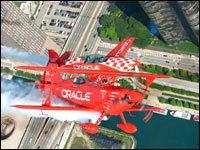 If you are in the Chicago Area be sure to get out to the lakefront this weekend and enjoy the Team Oracle performance! To the right you will find a few videos from both flights and also some photos below. I apologize for the shakiness of my video from the Seneca, this was my first stab at aerial photography.